PARIS (ESA PR) — Small satellites usually ride piggyback on larger missions but finding a suitable match is difficult because the launch date and orbit are set by the primary payload. A microlauncher can place a small satellite typically used for Earth observation, technology demonstration, education and telecoms into low orbits, starting from the ground or from an aerial platform. ESA has chosen five feasibility studies from industry proposing an economically viable, commercially self-sustaining microlauncher, without public funding. “A European commercial microlauncher can meet the growing need for dedicated launch services to companies with small satellites,” commented Jerome Breteau, manager of ESA’s Future Launchers Preparatory Programme. ArianeGroup, MT-Aerospace, ELV, Deimos and PLD Space are carrying out studies. 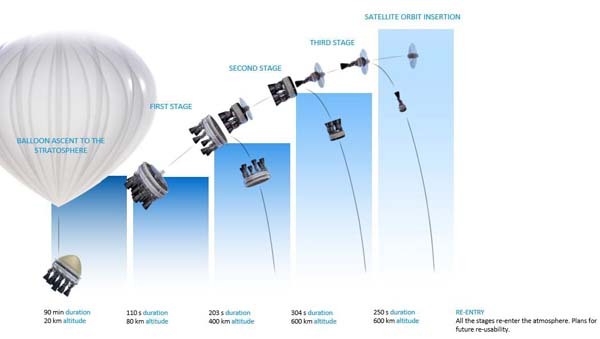 ArianeGroup in France proposes Q@ts – Quick Access to Space – a three-stage vehicle with a liftoff mass of 23 t, using hybrid propulsion including hydrogen peroxide. MT-Aerospace in Germany offers four concepts with either ground or air-launch capabilities: MTA, WARR, Bloostar and Daneo. The liquid-propellant MTA and WARR are launched from the ground. The two-stage MTA is 20 t at liftoff, while the three-stage WARR is 5 t at liftoff. Bloostar and Daneo are launched from aerial platforms, allowing a lower liftoff mass. Bloostar is a joint effort between MT-Aerospace and Zero2infinity. An air balloon carries Bloostar, weighing almost 5 t, to an altitude of 20 km and then separates. The three-stage vehicle then uses liquid propulsion to reach orbit. A Falcon 2000 aircraft carries the 4 t Daneo to an altitude of 15 km. Daneo reaches orbit using two solid-propellant stages followed by a liquid-propellant third stage. ELV in Italy proposes two configurations that rely on propulsion common with Vega, and the next-generation Vega-C and -E vehicles. Sharing existing building blocks and those under development would reduce costs. The Quick Launch Vehicle comprises two solid-propellant stages followed by a liquid-propellant third stage. The Final Launch Vehicle comprises a Vega-C first-stage solid motor and a second stage using liquid oxygen–methane propellant common with the next-generation launcher, Vega-E.
Deimos in Portugal proposes a two-stage launcher using liquid propellant, with a mass at liftoff of 17 t.
Spanish start-up PLD Space proposes Arion 2, a vertical launch vehicle with a liftoff mass of 14 t. It uses elements common with their Arion suborbital demonstrator and is powered by liquid oxygen–kerosene engines.